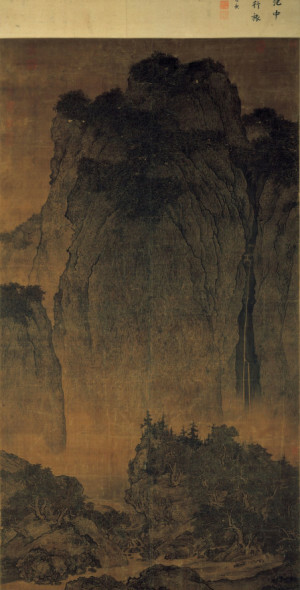 Many critics consider landscape to be the highest form of Chinese painting. Early landscape first appeared as part of figure painting, providing the natural setting for story narration. 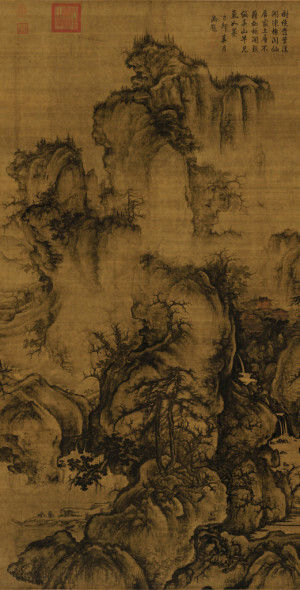 One of the earliest examples is Nymph of the Luo River by Gu Kaizhi (ca.344–406). 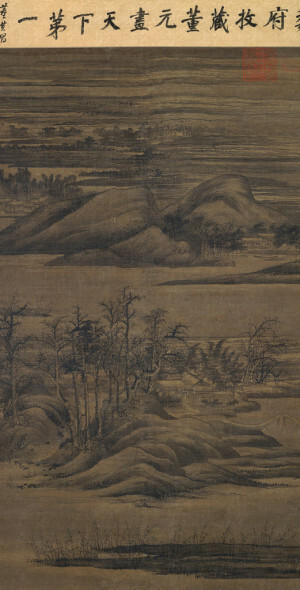 The original no longer exists, but there are Song dynasty (960–1279) versions in the Palace Museum, Beijing and Freer Gallery of Art, Washington, D.C.
By the beginning of the Tang dynasty (618–907), the tradition of landscape painting had advanced little, partly because of the ever-increasing demand for Buddhist icons and partly because artists were still struggling with the most elementary problems of space and depth. But during the Tang dynasty these difficulties were mastered. 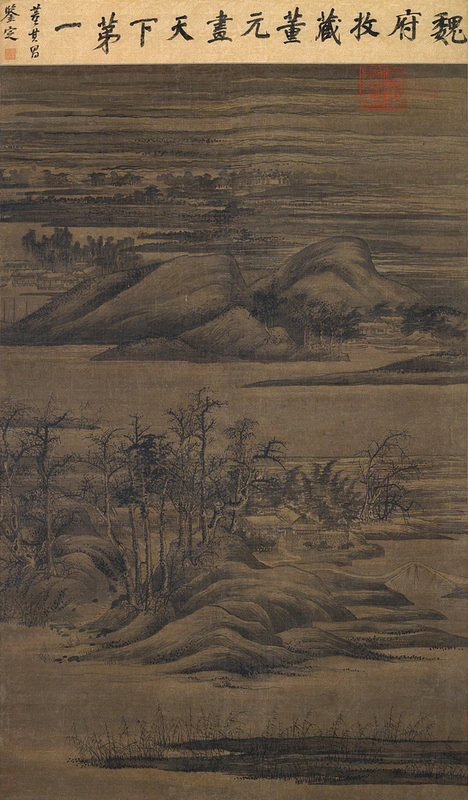 According to later Chinese art critics and historians, two schools of landscape painting emerged during the Tang dynasty. One, practiced by the court painter Li Sixun (李思訓, 653–718) and his son Li Zhaodao (李昭道, fl. 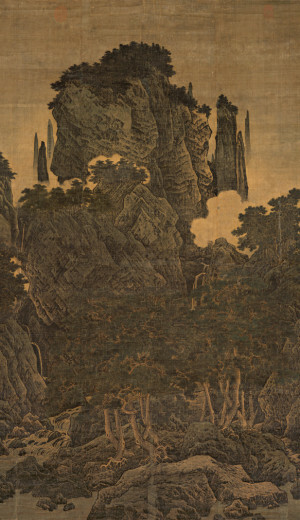 early 8th c.), painted in a highly decorative and meticulous fashion, employing the precise line technique derived from earlier artists such as Gu Kaizhi (顧愷之, 348–409) and Zhan Ziqian (展子虔, ca. 550–604). They often used mineral colors blue and green for decoration, so their genre of painting is known as blue-green landscape (青綠山水). 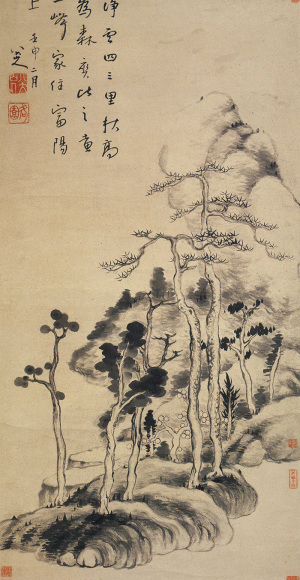 The other, founded by the poet-painter Wang Wei (王維, 701–761), painted in ink monochrome and developed a more spontaneous technique called pomo (“broken ink”), using varying shades of ink washes. These two schools were later (in the Ming dynasty) called the Northern School and Southern School respectively. It must be noted that the naming is not based on geographical regions, but an analogy to the different schools of Chan Buddhism. 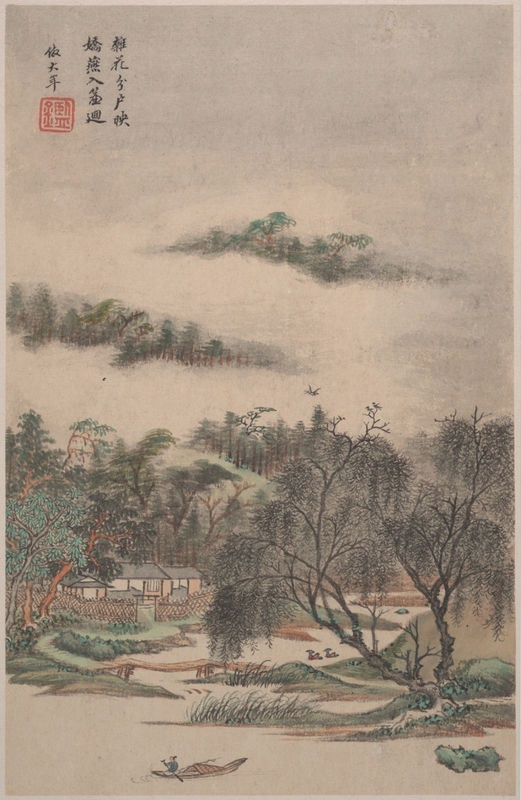 By the late Tang dynasty, landscape painting often embodied the universal longing of cultivated men to escape their quotidian world to commune with nature. 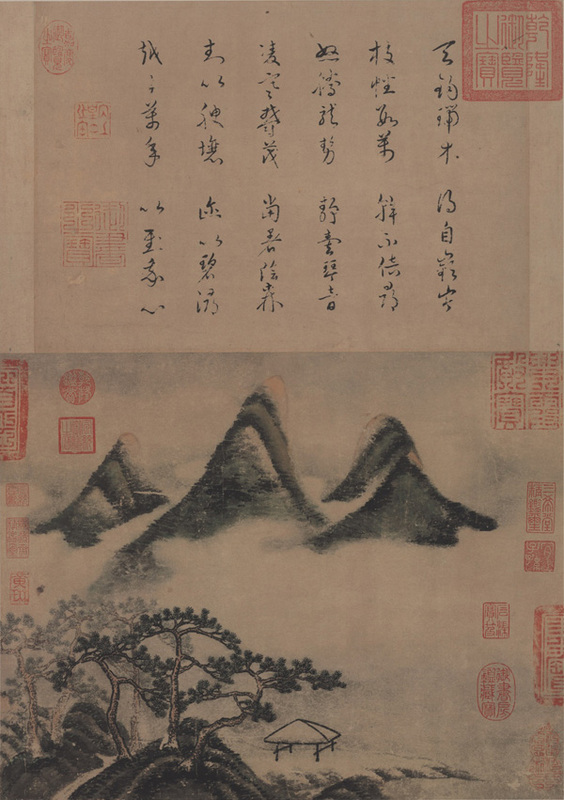 As the Tang dynasty disintegrated, the concept of withdrawal into the natural world became a major thematic focus of poets and painters. Faced with the failure of the human order, learned men sought permanence within the natural world, retreating into the mountains to find a sanctuary from the chaos of dynastic collapse. The time from the Five Dynasties period (907–960) to the Northern Song period (960–1127) is known as the “Great age of Chinese landscape”. In the north, artists such as Jing Hao (荊浩, ca. 880–940), Guan Tong (關仝, fl. 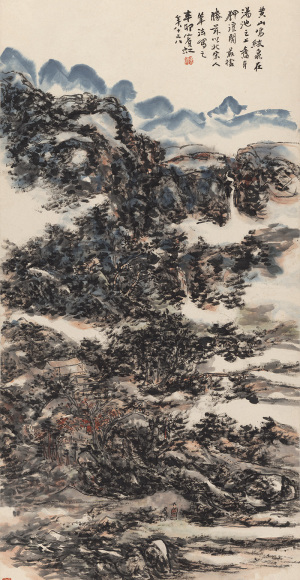 mid 10th c.), Li Cheng (李成, 919–967), Fan Kuan (范寬) and Guo Xi (郭熙) painted pictures of towering mountains, using strong black lines, ink wash, and sharp, dotted brushstrokes to suggest rough stone. 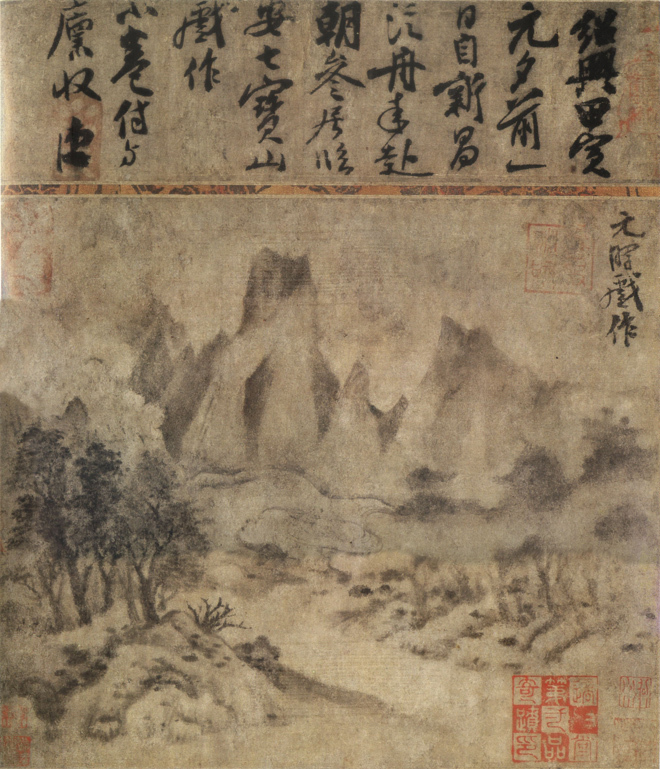 In the south, Dong Yuan (董源) and Juran (巨然) painted the rolling hills and rivers of their native countryside in peaceful scenes done with softer, rubbed brushwork. 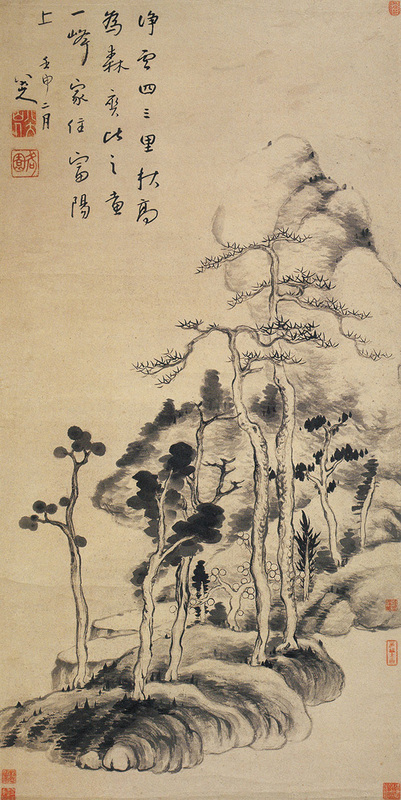 Also in the Northern Song, the seeds of a different notion of the purposes of painting were taking root in the minds of a small circle of intellectuals led by the great poet Su Shi (蘇軾). 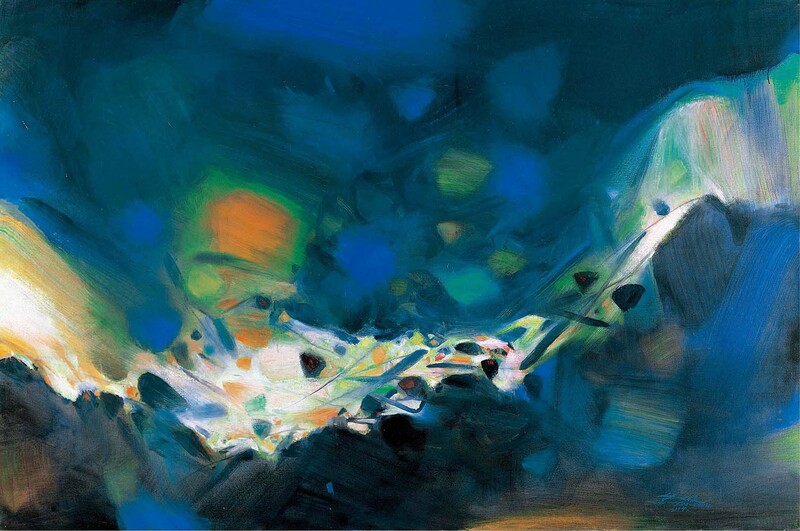 Su Shi formally theorized the revolutionary idea that the purpose of painting was not representation but expression. 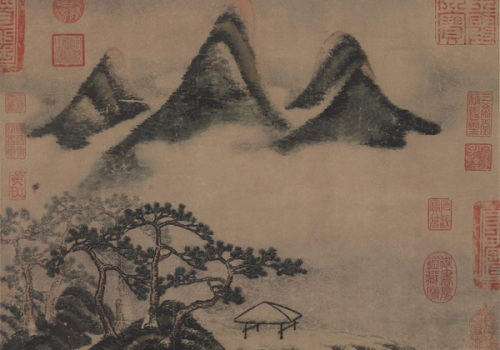 To Su Shi and his circle, the aim of a landscape painter was not to evoke in viewers the feelings they would have if they were actually wandering in the mountains, but rather to reveal to friends something of the artist’s own mind and heart. This became the fundamental principle of literati painting (文人畫). The work of these early scholar-painters was original, not because they strove for originality but because their art was the sincere and spontaneous expression of an original personality. One of the most remarkable of these men was Mi Fu (米芾), a critic, connoisseur, and eccentric. 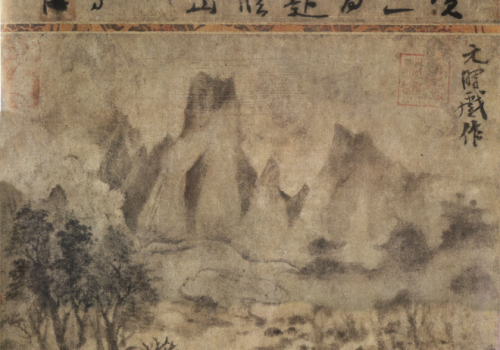 Mi Fu basically abandoned the drawn line, forming his mountains with rows of blobs of wet ink laid on the paper with the flat of the brush—a technique probably derived from Dong Yuan’s impressionism and highly evocative of the misty southern landscape that Mi Fu knew so well. This style was carried further by his son, Mi Youren (米友仁). After the invasion by the Jurchens, the Song court fled to the south. The classic northern tradition was transformed and transmitted to the Southern Song by Li Tang (李唐), who is credited with a monumental style based on the “ax-cut texture stroke (斧劈皴, fupi cun).” He was an old man when Bianjing (capital of Northern Song) fell, and most of his work must have perished with the imperial collection. 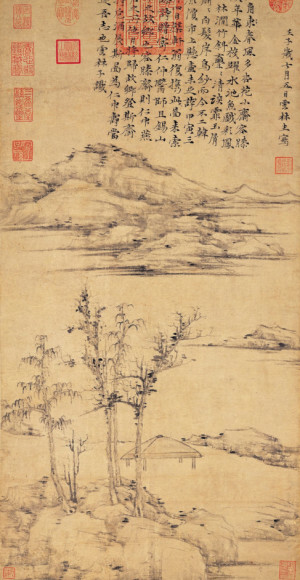 But copies, attributed paintings, and literary sources suggest that his style and influence dominated artistic expression in the twelfth century, making him a vital link between the remote grandeur of the Northern Song masters and the brilliant romanticism of Southern Song painters such as Ma Yuan (馬遠) and Xia Gui (夏圭). 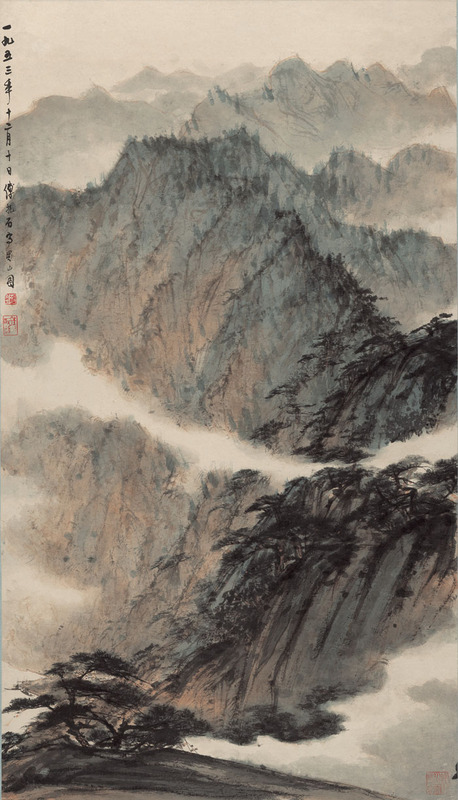 In Western eyes the work of the Ma-Xia School, with its obvious visual and emotional appeal, came in the early twentieth century to represent the quintessence of Chinese landscape painting. 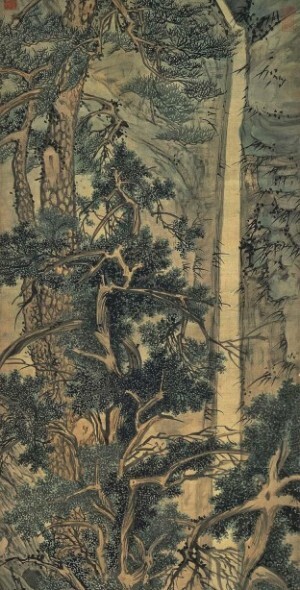 Their style, fused with the spectacular tonal contrasts of Fan Kuan and Guo Xi, the claw-like trees and roots of Li Cheng, and the ax-cut strokes of Li Tang, is in itself decorative and easily imitated in its outward aspects—qualities that were to be seized upon by Ming dynasty professional painters. They often achieved a sense of space by pushing the landscape to one corner or one side. There are many night scenes, and the atmosphere is often redolent of a poetic melancholy that hints at the underlying mood of Hangzhou in this age of deepening anxiety. On the other hand, the tradition of Dong Yuan lived in the farther south. 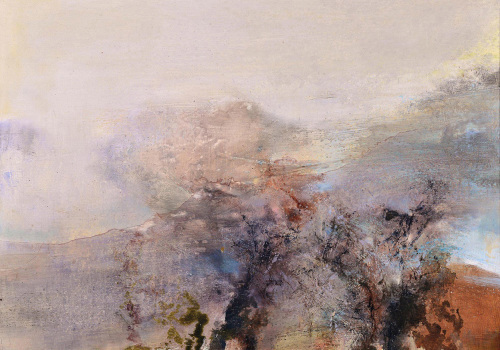 Landscapes of more subtle expression appeared; immeasurable distances were conveyed through the use of blurred outlines, mountain contours disappearing into the mist, and impressionistic treatment of natural phenomena. 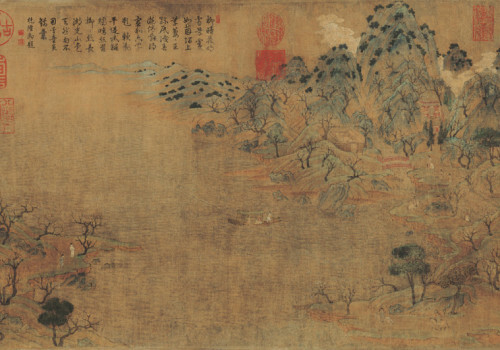 A fine example is the handscroll Dream Journey along the Xiao and Xiang Rivers, painted around 1170. 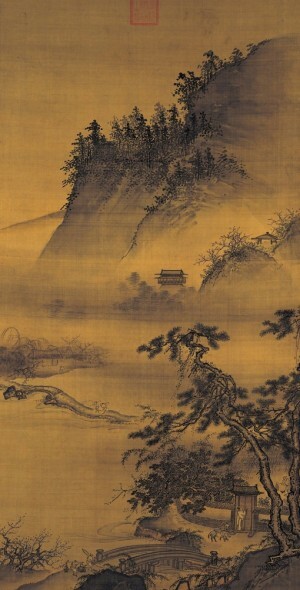 The painting combines in a wonderful way grandeur of conception, serenity of mood, sensitivity in the handling of distance through subtle grades of ink tone, and a human dimension in the delicate details of village life that cause us to wonder how many masterpieces of this period by unknown artists have been lost forever. 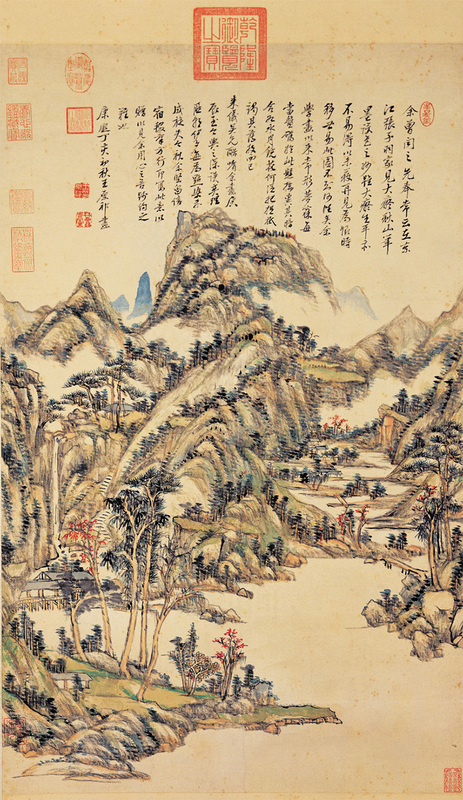 At least the survival of a handful of Southern Song paintings in this style helps us to understand how artists such as Huang Gongwang (黃公望) and Wu Zhen (吳鎮) were able to carry the Dong Yuan tradition through the succeeding Yuan dynasty. 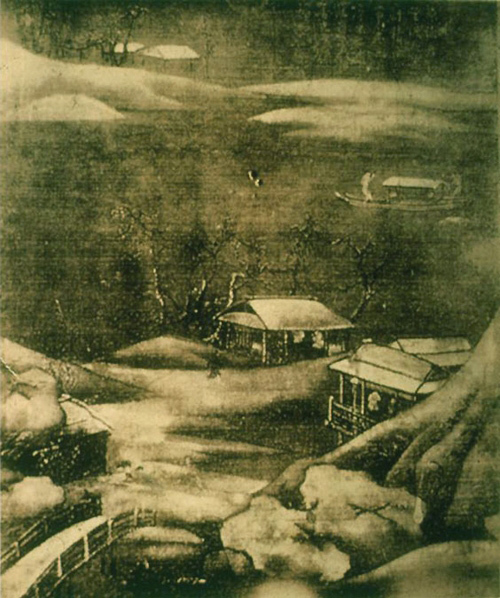 Under the Mongol Yuan dynasty (1271–1368), when many educated Chinese were barred from government service, the model of the Song literati retreat evolved into a full-blown alternative culture as this disenfranchised elite transformed their estates into sites for literary gatherings and other cultural pursuits. These gatherings were frequently commemorated in paintings that, rather than presenting a realistic depiction of an actual place, conveyed the shared cultural ideals of a reclusive world through a symbolic shorthand in which a villa might be represented by a humble thatched hut. Because a man’s studio or garden could be viewed as an extension of himself, paintings of such places often served to express the values of their owner. Painting was no longer about the description of the visible world; it became a means of conveying the inner landscape of the artist’s heart and mind. 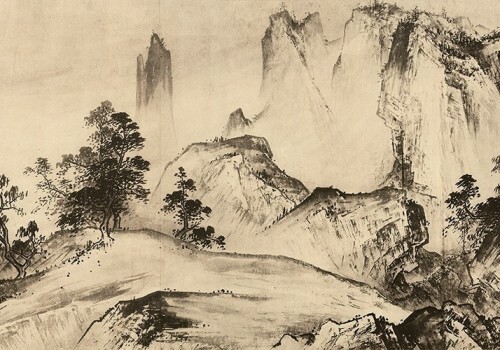 The most famous painters of this period include Zhao Mengfu (趙孟頫), and the Four Masters of the Yuan, namely Huang Gongwang (黃公望), Wu Zhen (吳鎮), Ni Zan (倪瓚), and Wang Meng (王蒙). 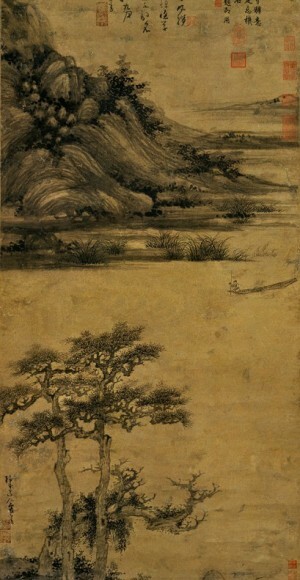 During the Ming dynasty (1368–1644), when native Chinese rule was restored, court artists led by Dai Jin (戴進) produced conservative images that revived the Song metaphor for the state as a well-ordered imperial garden, while literati painters pursued self-expressive goals through the stylistic language of Yuan scholar-artists. 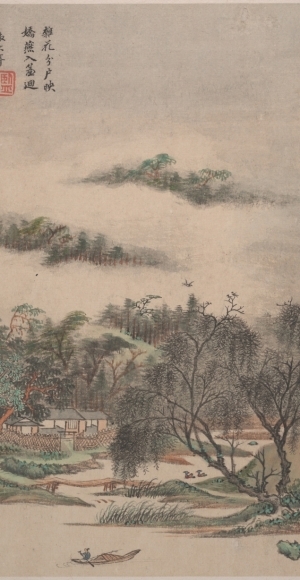 Shen Zhou (沈周), the patriarch of the Wu school of painting centered in the cosmopolitan city of Suzhou, and his preeminent follower Wen Zhengming (文徵明) exemplified Ming literati ideals. Both men devoted themselves to self-cultivation through a lifetime spent reinterpreting the styles of Yuan scholar-painters. 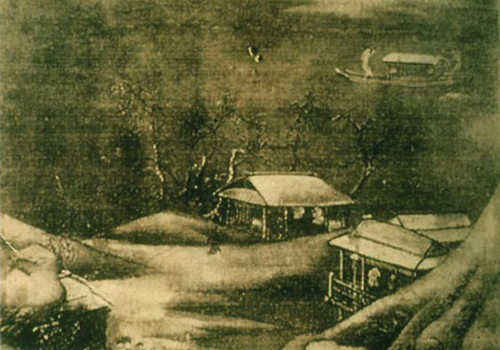 In the later development of the literary school no man played a more significant part than the scholar-painter Dong Qichang (董其昌, 1555–1636), who rose to high office during the Wanli reign. Not only did he embody in his paintings the aesthetic ideals of his class, but he also gave them theoretical formulation through his critical writings. 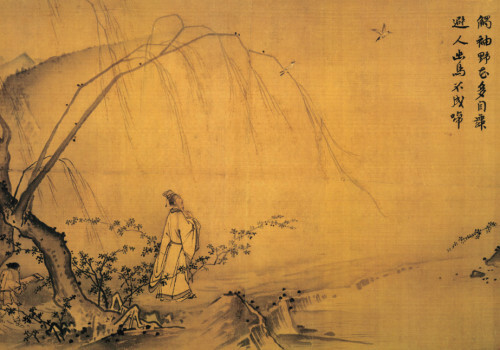 It was he, borrowing an idea first put forward by the poet-painter Du Qiong (杜瓊, 1396–1474) in the fifteenth century, who formulated the theory of the Northern and Southern Schools for the express purpose of demonstrating the superiority of the literati (wenren) tradition above all others. Dong Qichang called the tradition of the independent scholar-painter the Southern School because he saw in it an analogy to the Southern School of Chan Buddhism in the Tang dynasty, which had held that enlightenment came of itself, spontaneously and suddenly, as opposed to the Northern, or gradual, School, which had maintained that enlightenment could be attained only by degrees, after a lifetime of preparation and training. 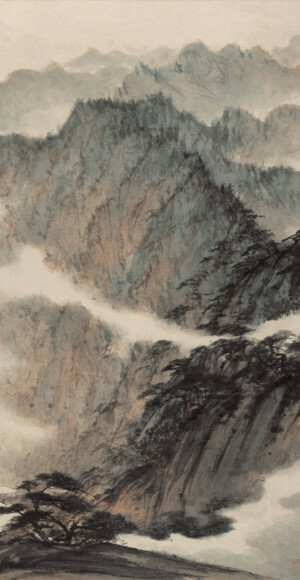 This theory has dominated Chinese art criticism for more than three centuries, but its inconsistencies have also caused endless confusion and debate among later scholars. Nevertheless, it provides a just division between two kinds of painting, the one in its purest manifestations academic, eclectic, precise, and decorative; the other free, calligraphic, personal, and subjective. The Ming dynasty was overthrown by the Manchus in 1644. However, the Qing court felt an intense admiration for Chinese culture and promoted the literati tradition as advocated by Dong Qichang, which became known as the orthodox school. 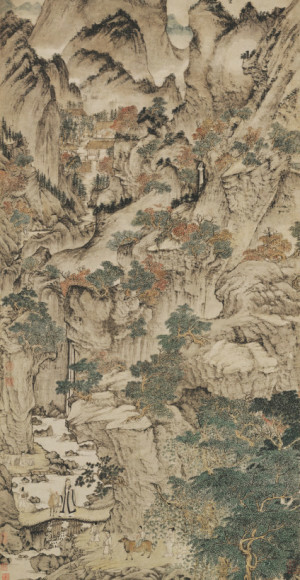 The most representative of this school is a group known as “Four Wangs.” The earliest of the four was Wang Shimin (王時敏, 1592–1680), who had learned to paint from Dong Qichang himself. Like his master, Wang Shimin deeply admired the broad, relaxed manner of Huang Gongwang, and often painted in the manner of the Yuan recluse. Wang Jian (王鑑, 1598–1677), Wang Shimin’s close friend, who also studied with Dong Qichang but only briefly, was an even more conscientious follower of the Yuan masters. 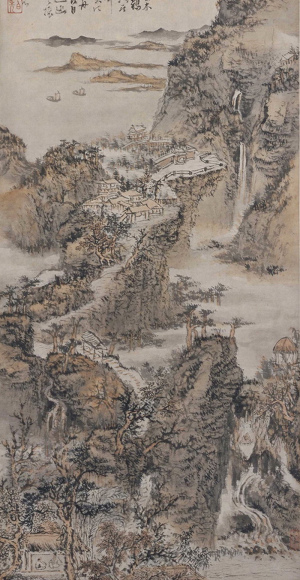 More gifted was Wang Hui (王翬, 1632–1717), who as a poor student had been introduced to Wang Shimin and became his pupil. The last of the four is Wang Yuanqi (王原祁, 1642–1715), who was perhaps the most gifted and original of the four. The grandson of Wang Shimin, he rose to high office under the Manchus and was a favorite of the Kangxi Emperor. The Four Wangs and their followers tried to achieve the “great synthesis” of style that Dong Qichang had advocated, studying and following the styles of the Song and Yuan masters. To give the impression that all Qing landscape is conventional would be utterly misleading. The Ming loyalists, called Yimin (遺民, literally, “people left over”), suffered acutely, for their code forbade their taking or holding office under a new dynasty, most of all an alien one. Many turned wanderer, monk, recluse, or eccentric. Among these “individualists”, the most notable is a group called “Four Monks”, often mentioned in contrast to the “Four Wangs”. These men are Zhu Da (朱耷, 1626–1705), Shitao (石濤, 1642–1707), Hongren (弘仁, 1610–1664), and Kuncan (髡殘, 1612–1673). Zhu Da was a distant descendant of the Ming imperial house who on the advent of the Manchus became a monk. 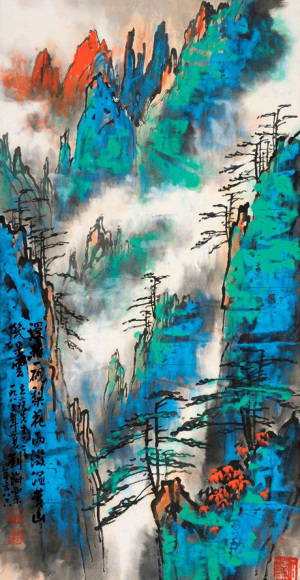 His brush style appears careless and slapdash, and yet, like that of the Chan eccentrics who were his spiritual ancestors, it is incredibly sure and confident. 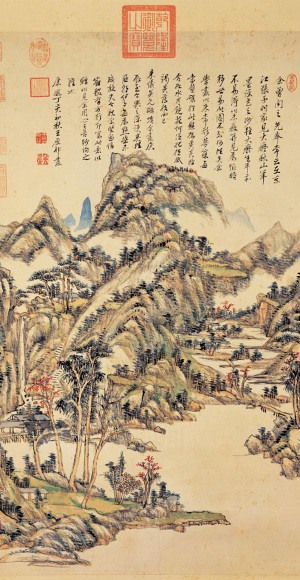 His landscapes executed in a dashing shorthand carry Dong Qichang’s creative distortion of the Southern tradition to a pitch that must have shocked the orthodox disciples of the late-Ming master. Shitao, original name Zhu Ruoji, was a lineal descendant of the founder of the Ming dynasty, which fell when he was a child. 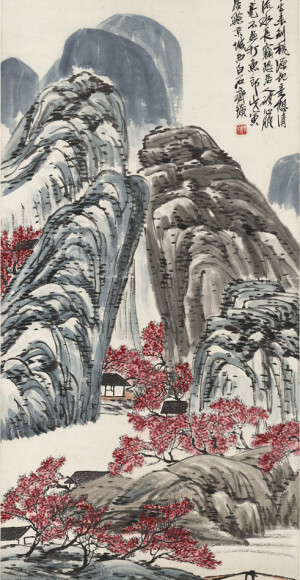 Shitao spent much of his life wandering about China, visiting sacred mountains in the company of monks, scholars, and painter-friends. 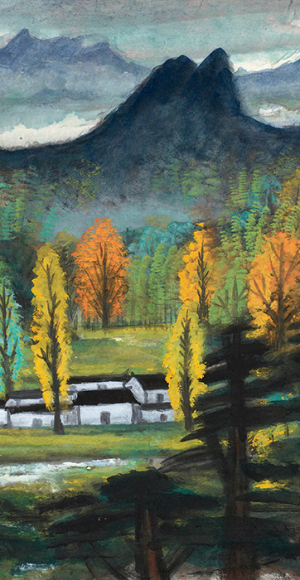 He finally settled in Yangzhou, and became a professional, though highly respected, painter. The other two of the four monks are Hongren and Kuncan. The Anhui monk Hongren expressed an inner serenity of spirit through his sparse, dry landscapes that exude an atmosphere of almost unearthly purity reminiscent of Ni Zan. 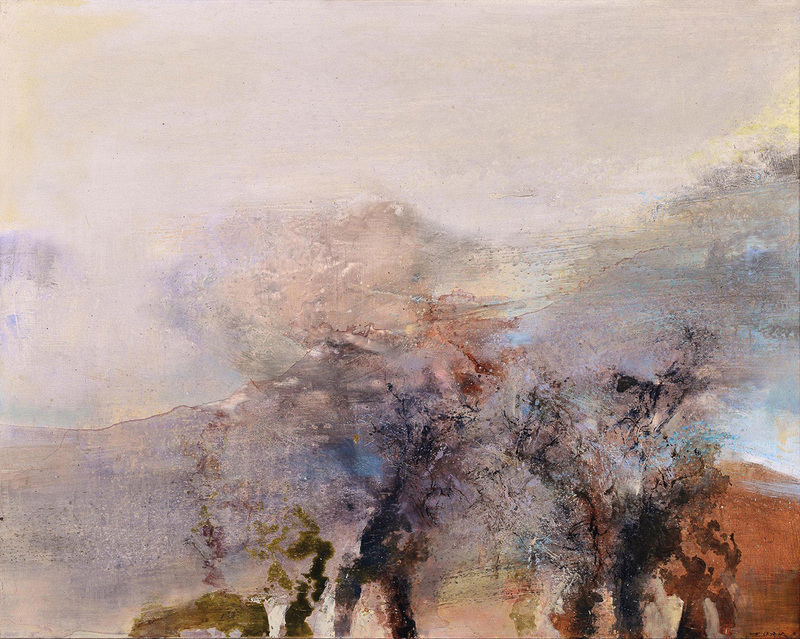 The texture of Kuncan’s landscapes, painted with a dry, scrubby brush, has a groping, almost fumbling, quality. Yet the final effect gives an impression of grandeur and serenity. 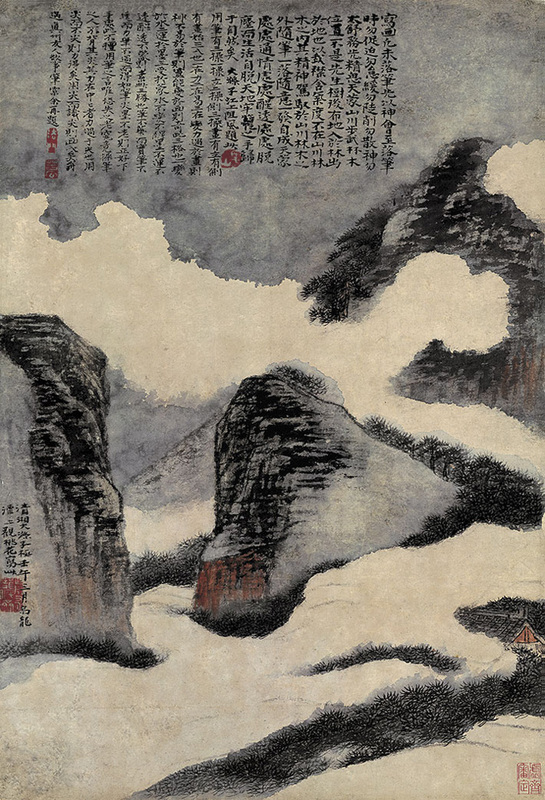 Fast-forwarding into the twentieth century, the modern movement in Chinese art was launched by the Cantonese artists Gao Jianfu (高劍父, 1879–1951), his brother Gao Qifeng (高奇峰, 1889–1933), and Chen Shuren (陳樹人, 1884–1948). They had studied in Japan, where the issues of modernization appeared earlier than they did in China. Inspired by the “New Japanese Style”, the Gao brothers and Chen inaugurated a “New National Painting” movement, which in turn gave rise to a Cantonese, or Lingnan (嶺南, “Range South”), regional style that incorporated Euro-Japanese characteristics. Soon after, by the 1920s, young Chinese artists were attracted not just to Japan but also to Paris and German art centers. A trio of these artists brought back some understanding of the essential contemporary European traditions and movements. Whereas Xu Beihong (徐悲鴻, 1895–1953) painted in oils in a conventional salon style, after his return from Europe he painted also in the Chinese medium with a touch of Western realism. 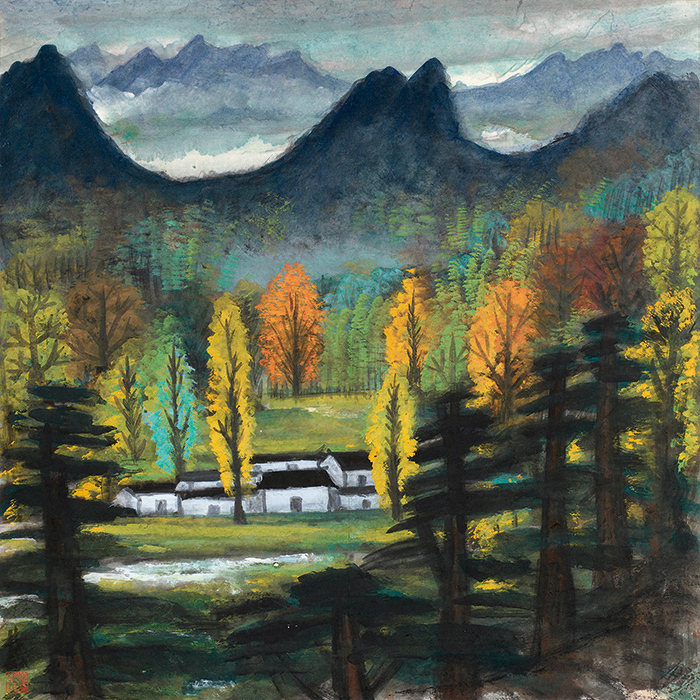 Liu Haisu (劉海粟, 1896–1994) was a devotee of the Post-Impressionists; while Lin Fengmian (林風眠, 1900–1991) was a follower of Matisse. All had their devoted students. The last years before the fall of the Nationalist Party in 1949 were a time of increasing confusion and anxiety. Yet the art world in the big cities revived, and leading artists such as Qi Baishi (齊白石, 1864–1957), Huang Binhong (黃賓虹, 1865–1955), and Fu Baoshi (傅抱石, 1904–1965) were producing some of their finest work. 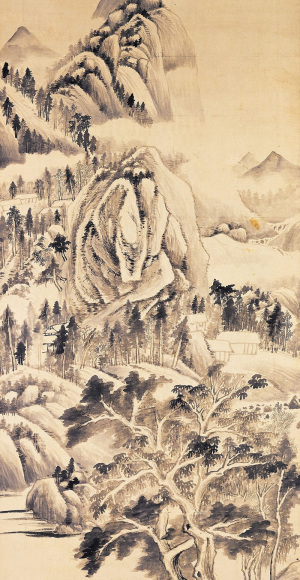 The Sichuan artist Zhang Daqian (張大千, 1899–1983), who had spent two years copying the wall paintings at Dunhuang, was establishing his reputation as a master of many styles, expert forger, and colorful and mischievous personality. He eventually settled down in Taiwan. For much of his career he had been a clever and eclectic artist. 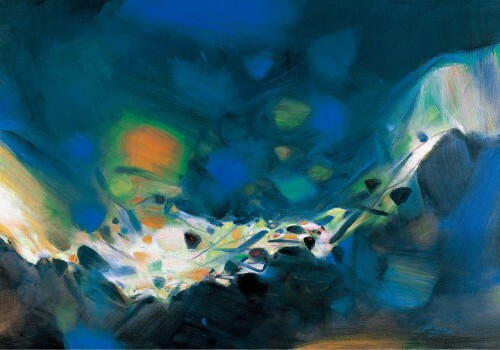 Only in his last years did he attain the status of a true master with his landscapes in splashed-colors. The finest of his oeuvre is the great unfinished panorama of Mount Lu. Although in the postwar years artists once again hoped to get to Europe, few succeeded. 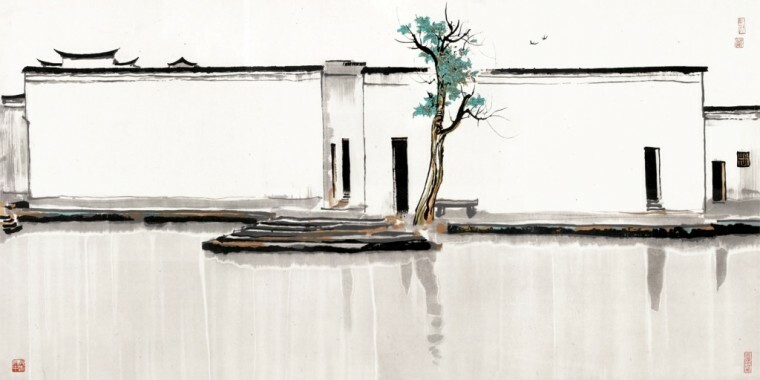 Among those who did were three of Lin Fengmian’s most gifted pupils, Zhao Wuji (Zao Wou-Ki, 1920–2013), Zhu Dechun (Chu Teh-Chun, 1920–2014), and Wu Guanzhong (1919–2010). 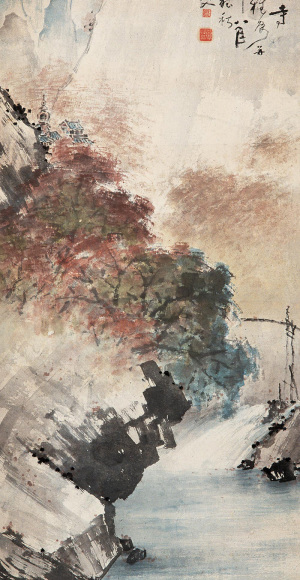 Both Zhao Wuji and Zhu Dechun settled in Paris and developed into Abstract Expressionists of great distinction, although their abstractions, painted with free calligraphic gestures in oils and acrylics, are still Chinese in their suggestions of landscapes. Wu Guanzhong after five years in Paris returned to Beijing in 1951 to teach at the Central Academy. Like many artists of his kind, he was to suffer severely in the coming political movements. However, after those turmoil years, he won great acclaim worldwide. In 1992, he became the first living Chinese artist to have a solo exhibition at the British Museum in London. 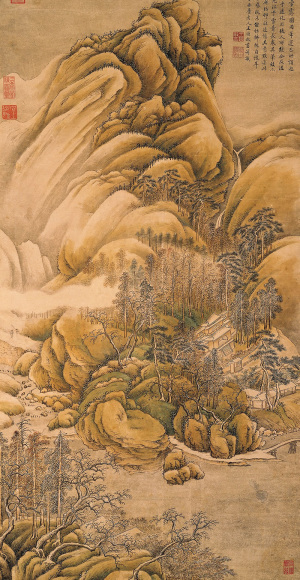 The painting of the last hundred years presents perhaps the most vivid illustration of the tensions between old ideas and new, native styles and foreign, that are shaping modern China. 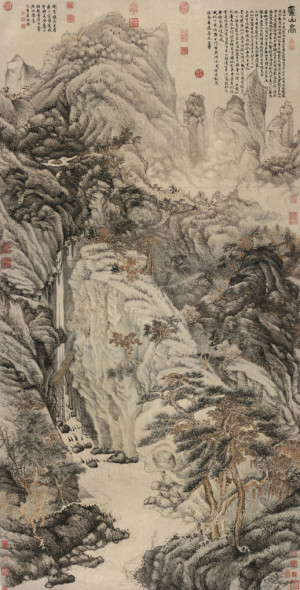 While the Chinese landscape has been transformed by millennia of human occupation, Chinese artistic expression has also been deeply imprinted with images of the natural world. 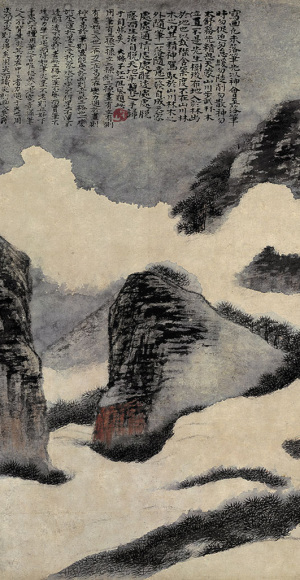 Viewing Chinese landscape paintings, it is clear that Chinese depictions of nature are seldom mere representations of the external world. Rather, they are expressions of the mind and heart of the individual artists—cultivated landscapes that embody the culture and cultivation of their masters. Based on articles from The Arts of China by Michael Sullivan. Thank you for helping promote Chinese art to the world.